This Monster Truck towers over the competition. The wheels alone sit taller than most people! 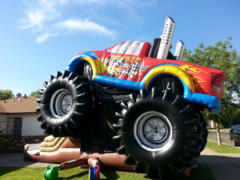 Reserve this inflatable and get ready for the ride of your life! This unit comes with a rockwall climb, a bounce area and a dry slide.